My quest for an acceptable Android tablet continues. I returned the ASUS Transformer Prime directly to ASUS due to a litany of problems that no number of returns could seem to resolve. I returned the Samsung Galaxy Tab 2 7” because its name was way too long for blogging (just kidding; I returned it because it was simply too slow). Currently, I’m trying out the Toshiba Excite 10, and it, too, is a real mixed bag. To begin with, don’t confuse this tablet with the Toshiba Excite 10 LE. The model I’m trying, the AT305, is an Nvidia Tegra 3-based tablet, while the LE model uses the Texas Instruments OMAP 4430. The LE is also the “thinnest tablet on the market,” as Toshiba describes it, while the AT305 is nice and thin (and light), but apparently not quite so much as the LE. It’s also $449.99 for 16GB ($529.99 for 32GB), while the LE is $529.99 for 16GB ($599.99 for 32GB). Update: A number of vendors have dropped the price on the Excite 10, including Amazon (buy it from Amazon and help support this site ). Confusing naming and pricing aside, the Toshiba Excite 10 that I’m reviewing has some real strengths and weaknesses, and I’ll note some of them below. This won’t be a thorough review, simply because I don’t have a great deal of time for one, and that’s unfortunate—there don’t seem to be a great number of reviews out there on this model, which makes me wonder just how serious Toshiba is about it. First, for the good stuff, and there’s enough here to make it a contender. The Excite runs pretty much bone stock Android ICS, specifically 4.0.3, and Toshiba has done very little to change it. That’s a good thing, because ICS on its own is an excellent tablet OS. The only thing holding it back from greatness is that it’s still a poor performer compared to iOS on the iPad, along with the relative lack of tablet-optimized apps, but neither of those problems can be pinned on Toshiba. Not only is the OS pretty much exactly as Google intended it, but Toshiba seems to have tuned it pretty well. 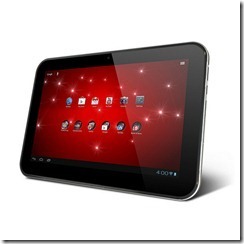 The Excite is the best performer of all the Android tablets I’ve tried so far, and it’s very stable. I haven’t run across a single app that doesn’t run well, and I’ve had very few crashes or other signs of instability. The only problem is an occasional Launcher crash where the icons disappear, but that happens seldom enough that it’s no more than a nuisance. The Excite is very thin (again, even if it’s not the thinnest) and light, and feels good in use. It’s light enough to be more comfortable than the new iPad, and has nicer curves and fewer sharp edges than the Transformer Prime. It’s still a 10.1” tablet, and so if you’re looking for real portability than a 7” tablet might be more to your liking, but for a larger tablet the Excite is a pleasure to hold. The Excite’s speakers are relatively loud and clear, and bring out details nicely. They get a little tinny at higher volumes, but I prefer them to the speakers on other Android tablets I’ve tried. They’re not quite as full as the new iPad to my ears, but they do get louder. Also, Toshiba has done some good things with their audio enhancements—the SRS surround sound works well, and sound doesn’t seem to get muffled when you prop the Excite up on your lap. Somehow, the sound seems to escape no matter the tablet’s orientation. I never thought I’d write positively about a tablet’s haptic feedback, particularly after the Transformer Prime’s anemic buzzing and twitching, but the Excite really does have strong and consistent vibration. Toshiba has extended it beyond the typical touch and typing feedback, with the tablet responding to a number of events with nice and strong vibration. For example, the tablet rumbles while scrolling, which does slow things down just a touch but adds a nice effect. The effects can be turned off, but I’ve found it adds another dimension (literally) to the experience. Unfortunately, the Excite has one weakness that, in my opinion, serves to offset its strengths and will likely send me looking for a new Android tablet. I have to admit, the new iPad has spoiled me. Apple did something special there, using a screen that not only has the best text I’ve seen on a computing device—seriously, it looks like a quality printed magazine—but also phenomenal colors and white balance (although that required a few tries due to the infamous “yellow tint”). Honestly, although I’m no fan of iOS and would much rather use an Android tablet, I keep going back to the iPad because everything looks so damn good. That said, some Android tablets do have better screens than others. The original Transformer had an excellent screen, especially for the price, and the Transformer Prime was also decent enough (although it, too, had a yellow tint problem, in my experience). My wife’s Samsung Galaxy Tab 10.1” also has an excellent screen, albeit colors are oversaturated as on many Samsung devices. The Excite 10, however, at least the one I’m using, falls well into the lower half in terms of screen quality. First, there’s significant light bleed, which seems to be a common problem with this device. Second, colors are washed out and contrast seems very low. I don’t know if this is due to Toshiba’s AutoBrite tuning feature, but at times colors are a little deeper and at times they’re flat and unimpressive. Third, and the killer for me, text is very pixelated and seems to lack the deep blackness that makes ebook reading and Web sites pleasant and without eye strain. This seems to be an issue with contrast, because text on some other Android tablets just stands out more and is thus easier to read. Update (6/19/2012): Some folks on forums have indicated that turning off auto-brightness resolves some of the color and contrast issues I noted on the Excite 10 that I tried out. Also, I’m looking at an Excite 7.7 review unit right now, and I’m seeing some of the same sorts of issues–and the 7.7 has an excellent AMOLED screen. I think these issues might indeed be related to Toshiba’s AutoBrite feature, and hopefully can be fixed in an update. I don’t expect the current generation of Android tablets to match the new iPadÂ in terms of screen quality, but I also don’t expect them to be downright unattractive. At least for me, the Toshiba Excite 10 falls into the latter category. Given the screen variability I’ve seen in pretty much every tablet I’ve used, including the iPad, it’s entirely possible that I received a bad unit. My advice, therefore, is to make sure to compare the screen against another tablet if you decide to give the Excite a try. I’ll be sending the tablet back to the vendor soon, and that’s entirely due to the screen. Everything else is excellent, from the build quality to the form factor to the performance, and I do like the playfulness of the haptic feedback. But nothing impacts how pleasant a tablet is to use more than the screen, and unfortunately the Excite falls flat in this respect. Ultimately, though, I have a feeling I’ll have a hard time finding an Android tablet that makes me happy until the next generation of 1920X1200 resolution screens are released, such as the ones on the upcoming ASUS Transformer Pad Infinity (TF700) and the Acer A700. Hopefully those will have excellent color and contrast as well, because it will take more than just higher resolution to match the new iPad’s excellent display.